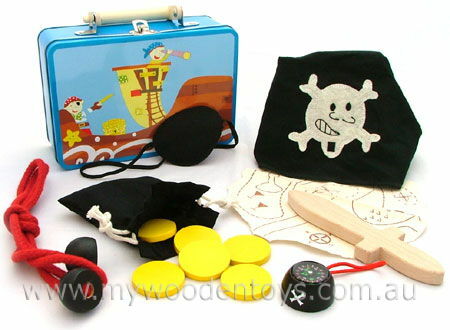 Pirate Tin Suitcase Adventure Set contains everything you will need for your plundering high seas journey. Rope to tie up enemies and practice knots (instructions included). A pull string bag with yellow wood coins. Real working compass in wooden base. Small wooden dagger (nicely rounded). A fantastic toy which encourages fantasy play and a great little tin case to keep everything together. The real working compass is a wonderful touch. We like this because: "We all know that Pirates carry tin suitcases.... don't we?"